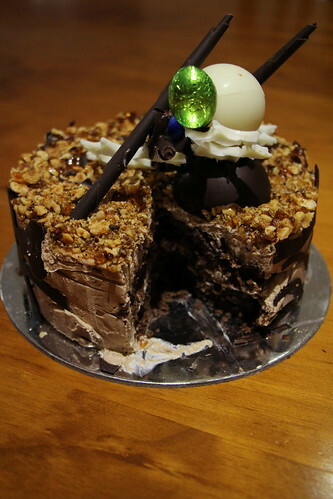 I first came across Cocoa Patisserie‘s cakes when we had the Hazelnut Mud Cake for one of my colleague’s birthdays. It has since become of my go to cakes for just about any occasion. Cocoa Patisserie is located on High Street, Kew and surprisingly it closes around 7pm on most nights which is great for after work if you just want to grab something. Cocoa not only serve cakes but pastries, coffees too (of course) but I haven’t yet had the pleasure to try. I’ve only tried their cakes, such as their Tiramisu and Pleasure Dome but their Hazelnut Mud Cake tops them all. What I love about this cake is the layers, the ever so light chocolate mousse combined with the moist mud cake (gluten free apparently!) and topped with chopped roasted hazelnuts and toffee pieces that adds the much needed crunchiness. Decorated with ganache and dark and white chocolate. 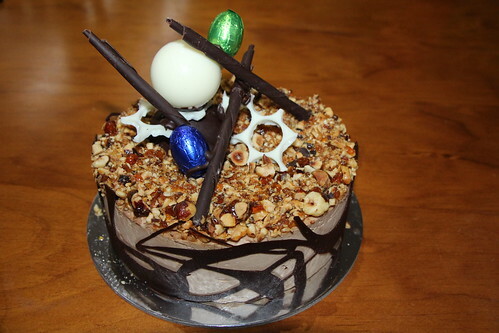 I adore nuts in cakes, and especially with cakes that aren’t too rich or sweet. It adds everything that I would want in a cake; moist, light, crunchy and not too sweet. You really can’t ask for more.